In a growing trend, private companies are stepping up to do what many of us find hard to manage on our own: offer composting services. To date, more than 100 individual businesses have begun serving Austin, Atlanta, Boston, Washington, D.C., and other cities that have yet to implement municipal composting programs. The goal is to make composting simple, affordable and hassle-free for people without the space or time to devote to it. Matthew Rostetter is the founder of CompostNow, based in Raleigh, North Carolina. His fast-growing company started hauling waste from residential homes, restaurants, and office buildings throughout the Triangle Area back in 2011. Now totaling 33, his team of self-proclaimed “soil slingers, route wrangles, dirt dorks, and brand ambassadors,” services just over 3,000 customers. In the month of March alone, they diverted about 340,000 pounds of compostable foods. The company’s business model has stayed the same since the beginning. Here's how it works: When you sign up for the service, you get a four-gallon bucket you can fill with compostable materials. CompostNow will take it all: banana peels, chicken bones, soiled paper, you name it. (Here's its simple guide to what customers can and cannot toss. You'd be surprised!) For $29 a month, CompostNow replaces your full bin for a fresh one, and gives you $5 in credit for any skipped weeks. The concept is working but Rostetter acknowledges the first step to success is educating the public about what’s at stake. Americans tend to think more about where our food comes from than where it goes after it’s tossed, which is a problem. Twenty to 30 percent of what we toss is made up of food scraps and yard waste, according to the Environmental Protection Agency. When stored in landfills, with no oxygen present, food waste releases large quantities of methane, a potent greenhouse gas. Diverting waste from landfills can play a critical role in curbing methane emissions. Kristen Baskin, the founder, CEO and Operations Manager of Let Us Compost, based in Athens, Georgia, approaches this problem simply. “The people we want to reach are the ones who think it’s important for the environment and want it to be convenient,” Kristen says. She and her team find the majority of these individuals by tabling at local farmers markets and hosting demonstrations at other green events. “In the beginning, I had all these wild ideas,” Baskin admits. Early on, the company piloted a hard-to-recycle materials pick-up service and a cloth diaper delivery service, neither of which was popular. “Those failed ideas are really expensive,” she says. The company has since managed to narrow the focus to biodegradable stuff that can be easily turned into fertilizer. Depending on the volume, Kristen's services can range from $120 to $1,300 a month. With the help of New Urban Forestry, they turn these ingredients into a variety of garden materials - Black Magic Mulch, Backyard Trail Mix, and all-purpose mulch - each of which is available for purchase on the site. While the operation is still tiny, there’s doubt Let Us Compost is growing. Since its founding in 2012, its team of five haulers has increased the number of pickup sites from just a handful to 275. Aaron, Nam, Chad, Eric and Bonnie now run routes six days a week throughout Athens, Watkinsville, and parts of Atlanta. “The work is really important to them,” Baskin says, and lets them further their personal commitment to sustainability. One of the haulers bikes everywhere and likes to forage for mushrooms; another is a passionate vegan. For CompostNow, the goal is a little more complex. Matthew Rostetter wants to see that waste is not just diverted but that it also finds its way back into the local food system. “A lot of people think of us as just a waste hauler or compost hauler,” Rostetter says, “but what we’re really doing is closing the loop.” With the help of his co-founders, Justin Senkbeil and Dominique Bischof, he has created a comprehensive system that tracks each member’s waste reduction and compost creation down to the pound. Customers have the option to earn their soil back whenever they want it or send it to one of the company’s “garden partners,” which include local community gardens, schoolyard plots, and nearby farms. This allows a vital resource to remain in the food cycle and sustain the growth of new crops. In addition to fertilizing plants and sequestering carbon, compost is said to reduce the need for chemical pesticides and fertilizers, and help prevent nutrient runoff and soil erosion. “Any area where we can help make that loop tighter, we get involved in,” Rostetter says. One way they do this? The company acts as a wholesaler of compostable products for member restaurants and offices so they can eventually become zero waste themselves. How long the company can sustain that offer remains to be seen but Rostetter is adamant that CompostNow will provide these extra services to its community as long as it can. Rostetter so believes in his company’s mission that he views other private composters as allies rather than competitors. He's not the only one. While alliances may be rare in the competitive world of startups, they seem to be rather common among members of the composting community. Within the last couple of years, CompostNow has merged with Tilthy Rich, a bike-hauler of compost in Durham, North Carolina, and Atlanta-based Compostwheels, formerly run by David Paull. Matt views the partnerships as a giant step forward. Atlanta is a big market he's looking to crack. That said, he’s in no hurry. “Growing sturdy roots is more important than growing quickly,” he says. Takeaway: CompostNow has put together a list of pickup services like its own, in cities around the country. Another option is to find a food recycling service in your area. 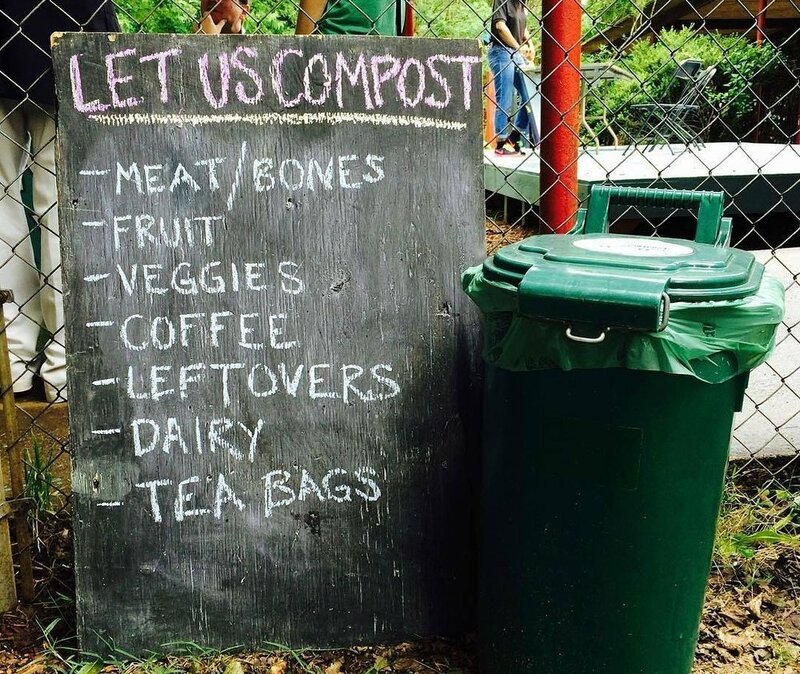 Finally, you can consider hauling your own compostable materials to a local farmers market. Feel like taking on the challenge in your own backyard? Check out our simple guide to composting for helpful tips on getting started. Here’s another excellent introduction to composting shared by a reader.